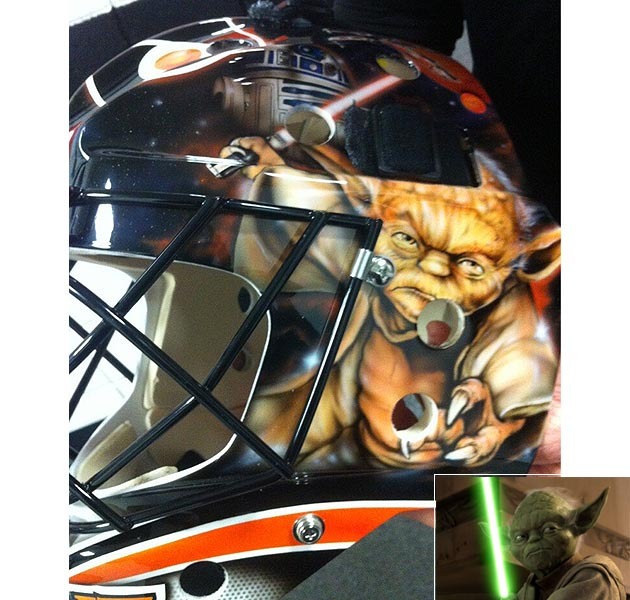 Because Ilya Bryzgalov is both a space aficionado and someone who completely understands the appeal of his “hockey’s greatest Cosmonaut” whimsy, of course the Philadelphia Flyers goalie is going to have a “Star Wars”-themed mask (via @NHLFlyers). Pretty cool stuff right there: Imperial Stormtrooper, TIE Fighter, Star Destroyer (a.k.a. being asked to play goal for the Flyers) and of course Bobby Clarke as Darth Vader (we’re assuming). But the other side of the mask … we sense a disturbance in the Force. Yoda, the diminutive Jedi Master, is wielding a red lightsaber. But Yoda’s lightsaber is green. More importantly, a red lightsaber is associated with the Sith, enemy of the Jedi, and the Dark Side of the Force; wielded by such scurrilous ne'er-do-wells as Darth Sideous, Darth Maul and Vader himself. Ah, you ponder, but what if Yoda simply stole that saber from a Sith he had sent into the Force ether? Please recall that Yoda’s lightsaber was created to scale, fitting only his tiny space Muppet hands. Unless the Sith recruited some sinister Jawa as an apprentice, their sabres are not Yoda-sized. So we are left to believe that artist Fran Drummond has created an affront to “Star Wars” fandom by turning Yoda to the Dark Side. To put this in Philadelphian sports terms, it’s a bit like a mask depicting Mike Schmidt as a New York Met, hugging Wilt Chamberlain dressed as a Knick. 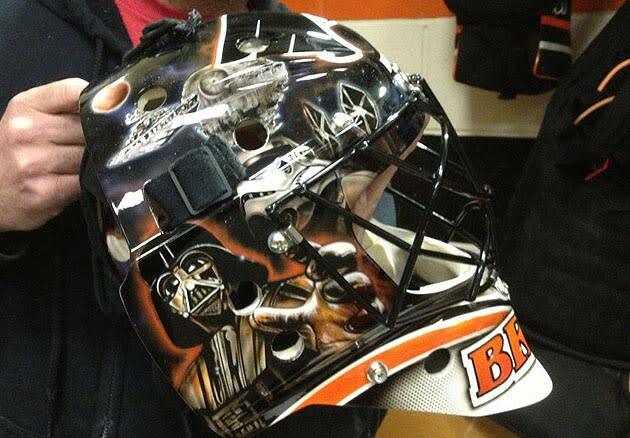 A beauty of a mask for Bryz, save for one fatal flaw. And by that we mean an image of Yoda from the prequels trilogy. Poo-doo. s/t Joe Gillespie for the link. • Forde Minutes: Who deserves a No. 1 seed?